Minnesota’s ruffed grouse spring drumming counts were higher than last year across most of the bird’s range, according to a report released by the Minnesota Department of Natural Resources (DNR). The averages, however, increased 18 percent in the northeast survey region, the core and bulk of grouse range in Minnesota, to 1.9 drums per stop. They also increased 16 percent to 2.1 drums per stop in the northwest and 32 percent to 0.4 drums per stop in the southeast. 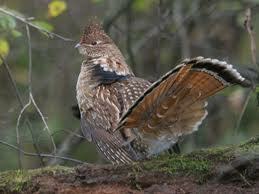 MADISON – There is good news for ruffed grouse hunters coming from 2011 spring drumming counts. Department of Natural Resources wildlife officials report that Wisconsin’s ruffed gouse population appears to have increased from last year, according to data collected by wildlife staff, foresters, wardens, and countless volunteers. “Statewide, the ruffed grouse population increased about 38 percent between 2010 and 2011,” said Scott Walter, DNR upland wildlife ecologist. “The southwest study region showed the greatest increase in drumming activity over the last year with a 118 percent increase, with all routes either increasing or remaining stable,” said Walter. “The central and northern regions both showed healthy increases of 31 percent and 43 percent, respectively.” No drumming grouse were heard on transects run in the southeast region, which contains the least amount of grouse cover in the state.